Grabit Pack – Another Alternative To Overstuffed Pockets | OhGizmo! 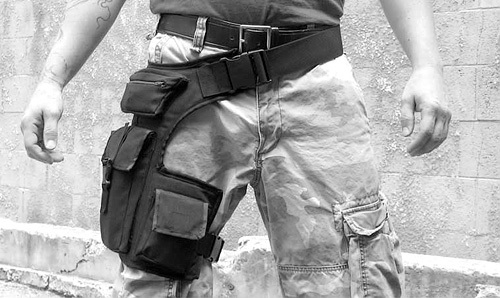 A while ago I wrote about a Hip and Shoulder Holster that provided an alternative way to carry a small collection of gadgets and other accessories without your pockets bulging. Well it’s been brought to my attention that there’s an even better, if slightly less subtle solution called the Grabit Pack. It uses a belt like a fanny pack (and yes, I’m familiar with the other uses of the term ‘fanny’) but hangs down the side of your leg instead. And for added security and to prevent it from bouncing around, it actually attaches to your thigh with another smaller belt. I’ll be quite honest that I would never use something like this for my day to day misadventures, but I can see many opportunities where it could be quite handy. Specifically when it comes to physical activities where a backpack would be too cumbersome, but there’s still the risk of things falling out of your pocket. And because of where the Grabit Pack sits, it doesn’t interfere with something like a tool belt if you’re a carpenter, and actually makes it easier to access its contents. In fact, dare I say it seems like the perfect accessory for wandering around the CES show floor keeping your phone, camera and other gadgets easily accessible. The Grabit Pack is available directly from the company’s website for just $23. Unfortunately at the moment the right side version is sold out, which is actually good news for south paws. Actually this has gotten me through zombie invasions (and other aliens and monsters as well). I do special makeup effects in addition to this product line. Man, you could be the neriest Laura Croft with this thing.